Length: 3 - 4.5mm. Background colour: black. Pattern colour: red spots. Number of spots: 2-4 (4). Spot fusions: none. Melanic (black) forms: not applicable. Pronotum: black. Leg colour: black. Other features: distinct rim around the edge of the elytra. Fourth-instar larva: grey and spiny but with shorter bristles than either the heather or kidney-spot ladybird; white patch on and around middle tubercle of first abdominal segment. Pupa: black and shiny with brown markings on thoracic region; larval skin encloses the lower part of the pupa. Habitats: Pine ladybirds can be found in a number of habitats including deciduous, coniferous and mixed woodland, grassland, coastal habitats (cliffs and dunes), heathland and marshy areas. This species is common in urban habitats. Pine ladybirds overlap with a number of other species of ladybird and are commonly found with pine-specialist ladybirds, plus 2-spot, 7-spot, 10-spot, 14-spot and harlequin ladybirds. 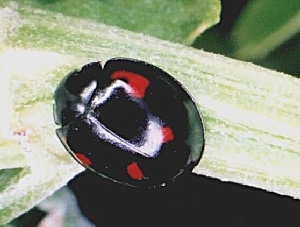 Host plants: The pine ladybird is so named because it is the most common species of ladybird found on pines. Whilst its name suggests specialisation on pines, it is found on a very diverse range of plants. These include needled conifers (particularly Scots pine), scale-leaved conifers, yew and many deciduous trees such as ash, birch, sallow, willow, oak, beech, lime, hazel, sycamore, maples and horse-chestnut. It is also commonly found in gardens on plants such as thistles, nettle, camellia and firethorns. Food: coccids, adelgids and other woolly aphids. 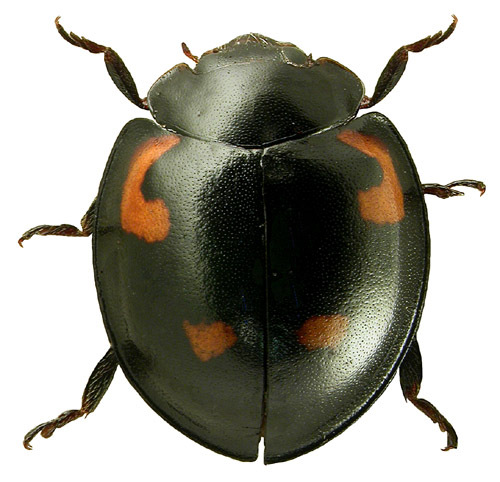 Overwintering sites: Pine ladybirds overwinter in leaf litter, foliage and bark crevices of evergreen trees and shrubs.